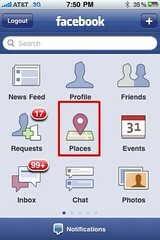 Facebook places is the latest major feature addition to the massive social network. You can use your iPhone or other compatible phone or iPod Touch presumably, and check in to any location when you’re out. You can describe what you’re doing and tag friends who are there with you. Essentially, you can look at this as a simplified version of foursquare built into Facebook itself. The similarities with foursquare don’t end there though as interestingly, the logo for places is actually what looks like a 4 in a square. In an interview, the lead designer on the project has said that it’s purely coincidental and that the team had found the news stories around the web on the subject funny. They are probably telling the truth but I can’t help but feel that they must have had foursquare on the brain while developing this, and for no one to see the 4 in the square is quite surprising really. Nevertheless, the service is here, and while it does lack the badge gaining and rewards system that foursquare has, what it does have in its favor is instant access to potentially half a billion registered users right out of the gate. I say right out of the gate, but in truth the service is rolling out slowly, first across the US at the moment, and then later everywhere else. To be honest, as much as I would like to say how much this is a terrible idea and how everyone should just use foursquare, I can’t help but feel that this is a better implementation. It’s all integrated, there are no unnecessary gimmicks and it’s easy to understand. Obviously, privacy is going to come into play here, but there are ways to make sure that only your closest friends can see where you are by using friends groups. No one is going to be forced to use this and therefore I can’t see any big privacy backlash incoming. For those who use it, I think it could prove useful. The original premise of Twitter was to communicate with close friends and possibly meet up with them. Twitter has since morphed into more of a social discussion tool instead and this and other similar services like foursquare and gowalla fill that original spot in the market much better. The foursquare founder recently said in an interview that he thought this new service was uninteresting and that there wasn’t much to it, but I disagree. I think that simplicity is key and that this service has potential to be more useful than his one is. It’s still fun as well but not in such an obvious way. This kind of location based social networking seems to be the latest trend with most main services integrating it in some way. Google have latitude which allows you to track your friends on a map using mobile or iGoogle. Twitter now also have a location system. It’s slightly different to Facebook places and others in that you don’t check in to a location but rather post in as much or as little detail as you choose, where you are when you post. This is entirely optional but is more proof of how social networking is set to get more and more intrusive into every aspect of our lives. This trend is set to continue but hopefully we’ll always have control over the privacy of these location services. It’ll be interesting to see how this works when they launch it here. It will also be interesting to see how it gathers the location, whether it be GPS, Wi-Fi or mobile phone towers, as well as how the service develops and how good the uptake is.